With the Lego Mortal Kombat Minifigures I created. I wanted to do a box set so I thought of a few ideas of different stages I could create. 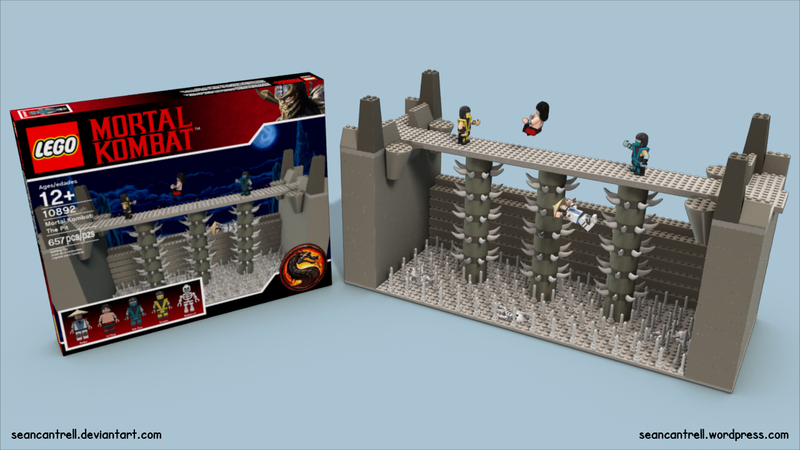 Decided to make The Pit stage from Mortal Kombat 1. Made all the standard Lego brick pieces. Built it from the ground up making sure to keep it’s size accurate to the Minifigures. Once the stage was built and I was happy with it colored it to match as best as possible and placed the MK minifigures on it. Then modeled out a simple box and created a texture for it to look like a real Lego box. I actually counted all the pieces in the set so there are 657 like it says on the box. The box number 10892 is the release date of Mortal Kombat 1 in Arcades. Modeled out the Skeleton to use for The Pit stage. There are two different versions of the Skeleton Minifigure I made the ball and socket arm one. So I could position his arms in various ways instead up just up or down. Created two bosses from the Mortal Kombat Games, Shao Kahn and Goro. Had to create a new body for Goro so he could have his four arms. 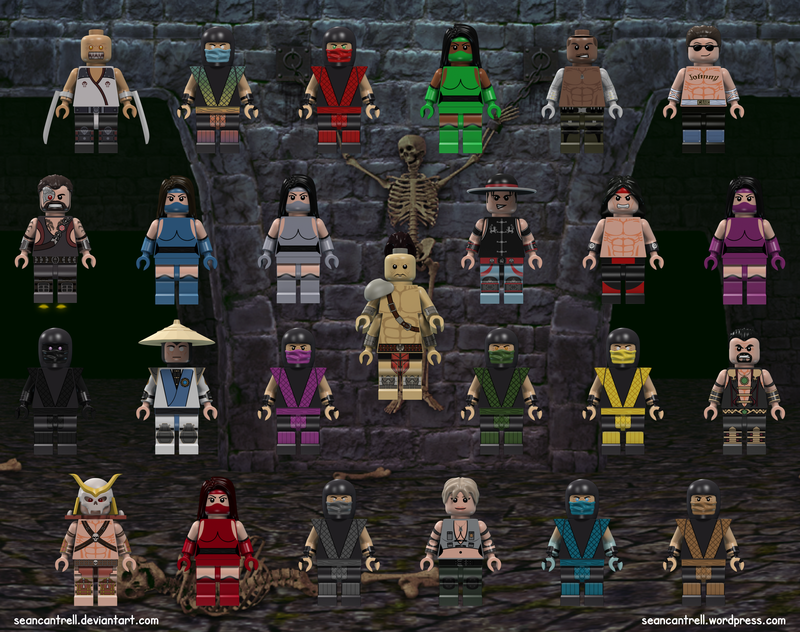 And below is a picture of all the Mortal Kombat Minifigures I created. My son just LOVES this set – we are planning to get it for him for his b-day. Thanks!! Thanks very much means a lot. You do know this isn’t a real Lego set? I created it in a 3D software. It could be made if you had all the pieces. Oh no!! Really? Gosh, my 5-year-old is obsessed with Legos and the new thing is Mortal Kombat because he plays the video game. Shoot, well – – is there a way that you can tell me what pieces I need for Dark Kahn, Scorpion, Sub-Zero, & Smoke. I know it might be a lot to ask, but I saw the excitement in his eyes and I feel so bad now that I cannot get it for him!! Lol – thanks for any help you can give. By the way, you did SUCH an awesome job with this. Is this something you do regularly? If not, you should think about it and Lego should hire you personally!! Please can you make a picture of all the characters in back view and side view? Thanks. It would never happen but I’d love for Lego to make something like this. The quality of some of the custom minifigures and sets out there is phenomenal. Who’s the light brown ninja in the bottom right corner and the gray female ninja in the second row next to Goro? The light brown male ninja is Tremor and the gray female ninja is Khameleon. I’m glad you like the set I created. It is not a real set you can not buy it any where it is just a concept I created using a 3D software. My son was wondering if you make these for sale … scorpion in particular? Also he wanted to know how you made scorpions hood …. He is trying to make it from another lego he has.